The European tour operator segment continued its comeback in 2018. Gross bookings are projected to climb 4% to €55.5 billion, with similar growth expected over the next several years, according to Phocuswright's recent travel research (see chart below). 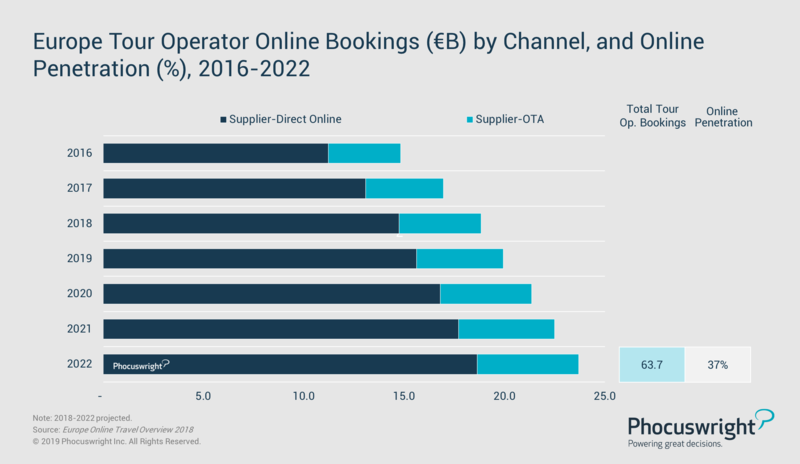 Due to the relatively high cost and relative complexity of vacation packages, the tour operator segment is heavily skewed toward offline booking channels with the lowest online penetration of any European travel segment. However, online channels are gaining traction as tour operators increasingly focus on improving and promoting their digital platforms; online penetration in the segment will rise to 37% by 2022. Traditional tour operators in Europe face rising competition on several fronts. OTAs continue to ramp up their dynamic packaging capabilities, enabling travelers to mix-and-match travel products to build their own custom vacation packages. And suppliers – especially hotels and airlines – are widening their own tour operator strategies. For example, easyJet announced an ambitious plan to expand its easyJet Holidays division into a major, pan-European holiday package firm. Join us at Phocuswright Europe (15-16 May in Amsterdam) as we cover what moves and defines the markets in 2019 and ahead. Register early for the best ticket pricing! Due in part to these challenges, consolidation is transforming the European tour operator landscape. In 2017, Monarch Holidays collapsed in the U.K., while in France, Vacances Transat was absorbed by TUI, Voyages FRAM was acquired by Karavel-Promovacances and Kuoni France exited the market. Meanwhile in Italy, market leader Alpitour acquired Eden Viaggi in April 2018, and will now control more than one fourth of the market there. The effect of this M&A activity was evident throughout 2018, with a variety of leadership and team integration issues affecting operational performance. However, overall growth is expected to continue over the next several years, as the sector stabilizes. Phocuswright's Open Access research subscribers have immediate access to these reports. Learn how your entire company can gain access to Phocuswright's full library of research here.